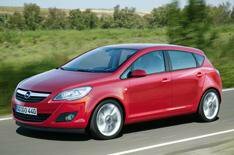 Vauxhall offers 0% finance and cashback | What Car? Vauxhall has launched a new 0% finance scheme that also pays buyers 5% of the amount they borrow when they take delivery of their new car. The package, called 'You pay, we pay', is available on most new Astras, Merivas, Tigras and Zafiras. Buyers can choose from a two-year 0% finance deal with no deposit, a three-year package with 0% finance and a 10% deposit, or a four-year 0% deal with 30% to be paid up front. Anyone taking up the deals will be given 5% of the amount they borrow in cashback. Buyers of an Astra hatchback 1.3 CDTi 90 Club, at its list price of 16,765, would get 838.25 cashback, for instance. However, buyers are still advised to haggle on list prices before committing to a deal.